These self-clinching studs are an ideal choice when dealing with thin-sheet materials. They can be effectively used in materials as thin as .020” (0.5mm) and will provide excellent overall performance. Self Clinching Studs for thin sheet materials works great for cold rolled steel. Thread: Class 2A, MIL-S-772, (6g ISO metric). The self-clinching stud is inserted into a properly sized hole that has either been drilled or punched into the sheet material. A manual press or an automated press device may be used to insert the stud. Depending on the thread size of the stud, in combination with the sheet material being used, an installation force of between 1300 and 3700 pounds will be required. When properly inserted, the stud head will project above the surface of the sheet material. It is important not to exceed the recommended installation force. When having to deal with very thin sheet material, it is important to select a self-clinching fastener that will provide sufficient thin-material performance. The non-flush, self-clinching stud is an ideal choice for those applications. 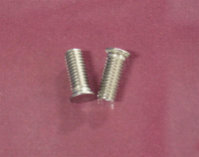 JHP Fasteners offers a wide assortment of these industrial fasteners at very competitive pricing. Contact us for any industrial fastener requirement you may have. We will work hard to win, and retain your business!